I wonder if there's anyone left in bloggersphere who hasn't heard of April's A-Z blogfest? and want to send them all my thanks for the hard work they put into it. Conclusions? It's an amazing event and I gained so many friends from it - bloggers who I'll keep in touch with and follow their posts. My only regret (and I think it's the same one voiced by many others) is that I only managed to get around to reading perhaps ten percent of the participants' posts. I'm sure I've missed out on reaching some talented bloggers, but I can't see what the solution to this problem is - unless the participant list is divided into categories: author blogs, reviewers, every-day events, serialized fiction, readers' blogs. Just a suggestion! In any case, I'll be participating next year. oh yeah a great idea---i think that would help lots---so glad i met you and you did a wonderful job! Congrats on finishing Sue! You did some terrific bloggin'! If it ever does come down to categories, hopefully they are very broad. Glad you had fun this year! Not sure categories are the solution, but the length of the list makes it impossible to get to all the participants. The Challenge was so much fun! My Reflections post is scheduled to be out on Wednesday and I suggested something about groups or categories like you did. The A-Z was a challenge, but one I enjoyed. I too gained lovely new followers, and found great new blogs to follow. Well done us for completing it. It's a manic, time-consuming month but the ensuing friendship is well worth the work! It was so much fun getting to know everyone. Having categories would be nice. Or the link to the list of blogs is still up (last I checked). So though I didn't make it to everyone in April, I'm still making the rounds. Thanks everyone - yes, I'm still trying to get round to seeing those on the linky list. I also think categories would be a great idea and I'm already looking forward to next year. It really is a great challenge! I know how you feel, I didn't get to read even a fraction of the ones I wanted to. Actually I saved the A-Z home page as one of my favorites and now that I am not posting daily I am finding alot more time to go back and read some more. I enjoyed re-connecting withyou Susan, and no, I didn't get round anywhere near all of them either. I've put the original list on my favs list and done the same withthe reflections list, so hope to keep visiting many new sites yet. I thoroghly enjoyed the challenge. This was my second crazy rollercoaster ride through the alphabet. There were too many blogs to get through, and I'm sure I missed out on some gems... but it was such fun! I'm definitely on board next year again... wouldn't miss it for the world! Congratulation on finishing the challenge. 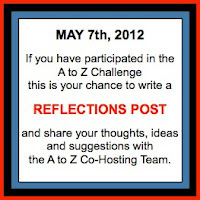 During the challenge I didn't visit as many blogs as I would like to but, cross my heart, I'm visiting every single one with the reflection post (and I'm almost done)! I am so glad my journey brought me here.